The Old English Sheepdog is a good-natured and overall happy and gentle dog breed. This breed of dog makes a remarkably great house pet because of its extremely good manners. The Old English Sheepdog has a unique personality and loves to entertain its family with comical actions. This type of dog blossoms with ample human companionship, making it quite the homebody. When it comes to its family, the Old English Sheepdog is exceptionally committed and devoted and treats children as if they were part of the flock. Even with strangers, this dog breed is overly friendly and welcoming. However, while it is extremely friendly and gentle, the Old English Sheepdog can have the tendency to be stubborn at times. 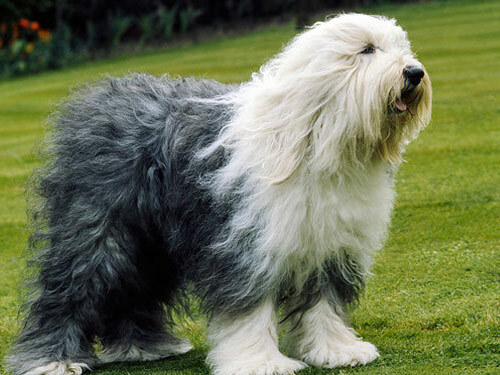 The Old English Sheepdog is said to have derived from the Bearded Collie or Russian Owtcharka in the west of England. This dog breed was the solution to the need for a mighty dog competent of protecting the flocks and herds from wolves that existed that the time. This dog breed was used primarily to drive cattle and sheep to market by the middle of the nineteenth century. Since they were working dogs, the Old English Sheepdog was exempt from dog taxes. However, in order to prove their occupation, their tails had to be docked. Ironically, this custom has continued to modern time and has created the nickname of Bobtail. This dog breed was first revealed in the late 1800’s and by the early 1900’s it was an admired show exhibit. In 1905, the Old English Sheepdog was recognized by the AKC. In earlier times, this breed could be brown, but then later was restricted to only shades of gray with white. Even though the modern Bobtail is extremely like the early breed, it has a more plentiful coat and solid body. As a pet, the Old English Sheepdog slowly grew in popularity. However, by the 1970’s this dog breed became a favorable housedog. Once this happened, its popularity skyrocketed with pet owners desiring a unique but loving pet.